For Jyeztha births in the feminine valence, the condition of conversational, discursive, explanatory, instructional, argumentative, commercializing Kumara may considerably affect the outcome. Instructional guidance is provided by emissaries from the civilizations of Antares. Their purpose is to communicate a forceful, dynamic, healing regeneration via sexual energy transfer and discovery of secrets. Budha-ruled Jyeztha gentlewomen are typically outspoken, incisive and decisive, competitive, descriptive, and authoritative communicators. They maintain a deep sense of mental seniority often leading to impatience with those less quick-witted . Articulate and pro-active in their messaging style, Jyeztha are often accomplished writers in literary genre ranging from autobiography to committee reports, Kita ladies find a ready audience on topics of a hidden, undisclosed, or forbidden nature. Jyeztha women are also natural trauma healers, investigative journalists, and detectives. Ketta-born ladies wield a penetrating ability to explain complex human sexual and psychological narratives. They are often found in powerful messaging roles, where secret information is revealed by a skillful shifting of the interpretive lens. The specialties of Zakradaivata include all of the commercial fields (Budha) along with psychotherapy and recovery work, self-help writing, and training of healers. Thriketta feminine-figures may also be found in the verbal realms of transformative criticism and promotion of mystical renewal. "...independent, self-sufficient , capable, dignified, proud. she will herself become wealthy through her own efforts. and she will be recognized as the head of the family . She is carefully canny regarding money matters . and secretly glories in being the pivot or centre around which her family affairs revolve. nichha-Chandra gives plenty of childhood polarizing catalysis with the mother, no matter the later-in-life compensations. 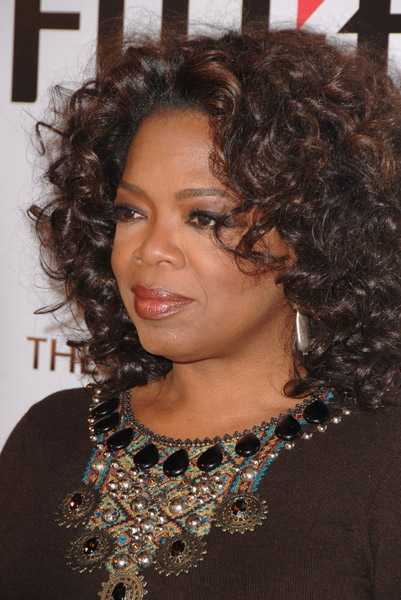 Winfrey reports an era of success in school but persistent sexual abuse from male relatives. randhresha-8 Budha = secret sexuality in bhava-3= relatives. Rahu in this cluster gives destruction of culture boundaries. Budha yuti karmesha-10 Surya = attempts to use argument as a tool to maintain respectable reputation. rogesha-6 Mangala + nichha Chandra = exploitation. Yes it is a wealth-producing Chandra-Mangala yoga but the emotional conditions of caretakers (Chandra) are aggressively (Kuja) exploitive as well. Vriddhipathi-11 Budha = earnings in bhava-3 = announcements, journalism, media programming. Surya-yuti-Budha + Zukra-yuti-Rahu = exotic beauty through attractive bone structure with Zukra-yuti-Rahu + karmesha-10 Surya in bhava-3 . Ravi weakened in Makara a weak rashi. Yet like all the Makara graha in this kundali Surya is greatly benefitted by Professor Shani in the uttamza, a career-strengthening 10th-angle from Surya. Surya + Budha + Zukra = auspicious mix for speech and face as expressions of fortune . Rahu does good work in 3, 6, 10, and 11. Rahu makes this hyper-communicative messaging information-delivery cluster truly spectacular. randhresha-8 Budha + dharmesha-9 Chandra = hidden childbirth (9). Move to home of her father (9) age 14-15 = sudden, forced changes of material conditions and psychological identity (8). Randhra-induced forced change under auspice of Budha however difficult bears reasonably good fruit in the form of a self-reflective (Surya) narrative (Budha) of personal transformation (8). Sudden forced changes as the mechanism of self-discovery will become a marker of Winfrey's huge success in confessional journalism. uttama bhratrupathi-3 + bandesha-4 Shani = siblings, cohort, relatives and home people. Establishes a Life Friendship (L-3) with a female peer whose attitudes and traits resemble family. Guru in bhava-7 = favorable settlement of criminal lawsuits. 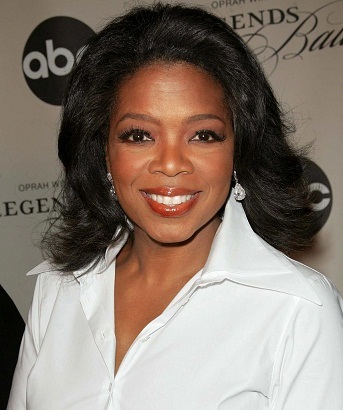 Oprah was sued by the Texas cattleman's association for defaming the health effects of eating infected beef. She was judged not guilty. Vimshottari bhuktis of Zukra, in the bhukti of any graha which occupies 4th-from-Zukra, may be difficult in matters of parent-security love vs. partner-equality love. It is a surprisingly challenging bhukti for intimate partnership that creates temporary conditions of restless insecurity and discontent with existing contractual terms. After being birthed in the American South by a teenage unwed mother who soon left for the North, Winfrey's spent the first six years of life on the impoverished Mississippi farm of her maternal grandparents. 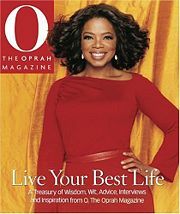 Winfrey credits her grandmother's faith in Oprah's ability for much of her adult self-confidence. That confidence allowed Winfrey to cross many barriers and accomplish her goals. Maternal grandmother = 4th from Chandra = Kumbha bhava-4 ruled by Shani = home, basic education, emotional security. Professor Shani operates in social invisible contexts when He resides in bhava-12. Yet in His uttamza where social justice and equitable terms of contract remain His highest duty, Shani remains highly structured. Shani is strictly lawful, and a bit imprisoning perhaps in Vyaya bhava. As bandesha-4 in 10th from 4th, Shani representing Grandmother is a highly stabilizing factor; yet also Shani-12 indicates scarcity conditions, dark ignorance or superstition, and fear of the invisible. Winfrey also describes a harsh and what would now be considered abusive level of punishment, along with severe poverty, in her early years. Rahu in bhava-3 * in swabhava of Busy Budha, the Shadowy Specter seeks privilege via glamorous or unusual writing, reporting, news announcements, cinema, commentary, messaging. Craves publication. Desires a special, important explanatory, descriptive, or instructional role. Over-reaching in commercial business, internet, cinema, or communications media. Exciting, opportunistic engagement with process management, manufacturing, business administration, conversations, information technology. Ambitious character of the sibling-cousin, cohort, or touring ensemble. chalakaraka Rahu = self-elevating desire to be recognized and privileged as a writer or messenger, missionary, envoy, apostle, who delivers important instructions and announcements. Rahu in bhava-3 gives extraordinary desire for success in commerce, communications media May be a taboo-breaker in matters of communication and signaling. Budha-Rahu bhukti= Miss Black Tennessee pageant, showcasing Winfrey's remarkable poise and beauty in the bright lights of center-stage (Rahu-Surya) position. Rahu in bhava-3+ Zukra + karmesha-10 Surya visibility + Vriddhipathi-11 Budha (gains and goals). chidrakaraka Ketu = self-deprecating ambivalence toward patriarchal religion, orthodox piety and guru-father-priest figures. "Witness " viewpoint gives cosmological neutrality in religious philosophy. Ketu = usually a scattering force. In a rare instance for Winfrey's nativity, Ketu gets motivation to get public visibility from Surya, energy and articulation to communication from Budha, beauty and relationship concerns from Zukra, and personal discipline with a powerful work ethic from the professionalizing 10th drishti of structuring uttama-amza Shani. The prognosis for father, which would normally be challenging due to Ketu-9 while dharmesha-9 Chandra occupies Jyestha , improves a great deal because of all this supporting, enlivening drishti upon the chidrakaraka. During the hard-working and disciplined Shani bhukti, Winfrey produces an almost immediate ratings improvement for the failing TV talk-show into which she was hired. She begins to receive market share from the competition. Ketu+ randhresha-8 /Vriddhipathi-11 Budha bhukti = meets and exceeds projected performance goals. The confessional style of self-revealing secrets (8), public discussion of personal trauma especially sexual invasion (8) and the psychological healing goals of this intensely penetrating style of self-disclosure become the trademarks of Winfrey's forthcoming spectacular success.